"Having finished second (2014) and third (2015), David Bishop would very much like to complete the podium set this time around. Second recently at the Jenson Button Trust Triathlon, he's been slightly frustrated this year with good performances across all disciplines - just not all on the same day. This weekend would be a great time to get it all right." Well, 'get it all right' he did, and he now has a complete set of medals from the last three editions - with Sunday's race probably the best of his career to date. 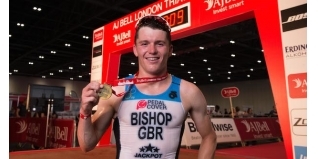 I spoke to David to find out a bit more about his race and his plans for the rest of the season - which include another big domestic race on Sunday at the British Elite Triathlon Championships in Liverpool. Congratulations David, a great day for you on Sunday. Of course, I'm really happy. Having finished third last year and second two years ago, I'm really excited to have finally won the London Triathlon. I remember watching it as Youth and Junior athlete and seeing some of the top names who have won it in the past, so it is great to have my name alongside those guys who I looked up to. Was it one of those days when everything just goes right and you feel good from the start? I did have a good start. I was fortunate that I was one of the athletes announced at the start pre-race, so that meant I got to chose my starting position for the swim. Instead of going over to the right hand side as usual, I noticed that Dan Wilson and Matt Roberts from Australia, both good swimmers, were on the left and so I stuck with them. It proved to be a good move and it was plain sailing in the swim. On the return leg I could see Nathan Tweedie and Harry Wiltshire close by, so I knew I was in very good company and that it was going really well in the water. I think there was perhaps around ten of us out of the swim with around a 15 second lead. I pushed it hard through T1 and then once we were on the bike that reduced quickly to about seven, with myself, Dan, Matt, Harry, Kenji Nener (AUS), Alastar Rogers and Aaron Harris. "How did that good swim translate to the bike?" The bike was brilliant. I've never been in that type of group before where everyone just drilled it. There was no slacking. Dan Wilson was really strong on the bike - he's just won the Alpe d'Huez Triathlon - and Harry Wiltshire was really good too, in making sure we were co-ordinated, when to 'through and off' and when to hold it in a pace line. Unfortunately Aaron had a mechanical problem towards the end and so dropped back because of that. It was a very strong group effort though and it meant we held off the chasing pack. I went out at a solid pace on the run. I'd assumed that Dan Wilson and Matt Roberts would pretty quickly appear on my shoulder, but they didn't and it just went well. The gap got bigger and bigger each lap. I started to feel tired in the second half, but the gap was significant and I pretty much knew for the whole of the last lap of the run that I had it won. Coming into the finish as the winner was fantastic. The race has such a history of great winners and it is great to be able to say I won it too. Would you put that down as your biggest and best result to date? I think so. I've had some really good races before - probably the Antalya ETU European Cup race last year when I was eighth was one of my best races, but it was awesome to actually win... and of course to collect a nice cheque which will help sort my overdraft out! I last spoke to you a few weeks back at the Jenson Button Trust Triathlon and you were dealing with a few running injury niggles. Do you think this is a good sign that you've got over that now? I hope so. I took nine days totally off running after that Jenson Button race, and while doing that I did a couple of 20 hour bike weeks. I dropped a bit of weight in the process which probably helped, but I've only really done a couple of quality run sessions since - but it worked well on Sunday at least. From London we go straight into what looks like a high quality event at Tri Liverpool for the British Elite Championships on Sunday (14th). You must be looking forward to that even more now? I'm really excited to be racing alongside my brother, Tom. We train and race really well together. We're not especially competitive (with each other), and so we'll certainly be looking to see if we can work together for a strong result. We're both biking well, so hopefully we can do something to impact the race in our favour. Despite the Olympic Games, the start-list for Liverpool looks very strong, with all of the top British Juniors racing too. It's really exciting. With it being a Junior selection race for the World's, all of the top Juniors are there, like Ben Dijkstra, Alex Yee, Sam Dickinson and co., plus Adam Bowden, Morgan Davies and plenty of others. The Juniors are really strong at the moment and it is a big race for them, so there should be some good action on Sunday. Normally I get nervous before races, but I think having just won London the pressure is off a bit and so I'm just really excited to race. Do you have any longer term plans for the rest of the year after Liverpool? I've got no concrete plans at the moment. I'm going on a bit of a holiday with the family after Liverpool. I've been doing a fair bit of cycling with Will Clarke and so there is a little bit of me tempted to have a go at a 70.3 race. However, I still want to do a 'perfect' ITU race, where i think I've nailed all three disciplines to see where that puts me, probably a World Cup race somewhere.